I saw this on Pinterest and had to give it a try. Heat oven to 350 degrees. Slice the pepper in half and gut it. Cook the meat and mushrooms in a frying pan til the meat is just cooked. 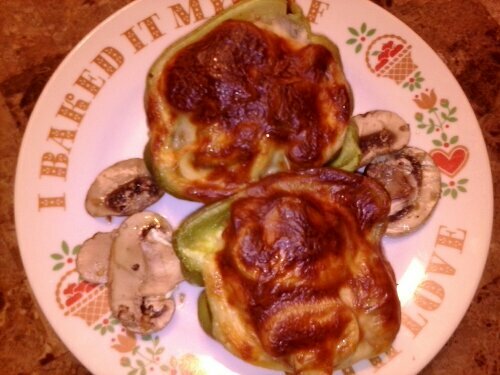 Place half the cheese in the bottom of the peppers and place the meat mixture into the peppers next. The top with remaining cheese. Bake 25 minutes. Enjoy! Again another recipe with great bacon. Chop up bacon. 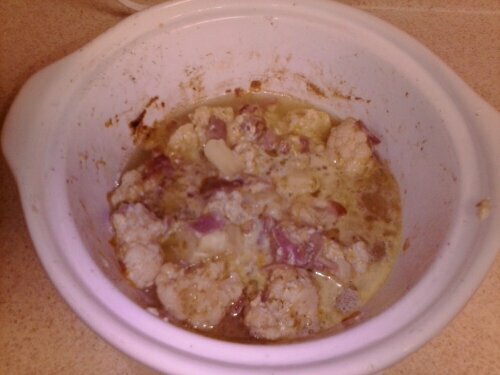 Mix all in a crockpot and cook low for 8 hours. The time may be less depending on the crockpot. 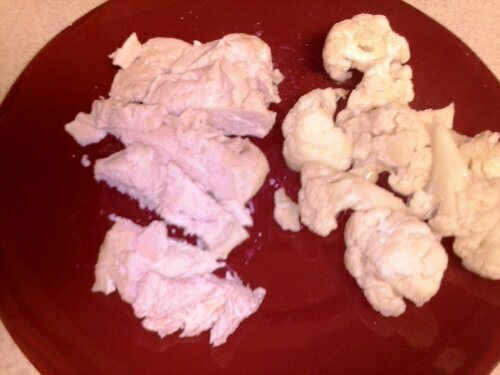 Check the consistency of the cauliflower. I was so excited that they added turkey bacon to the approved list so I had to make this. Chop up bacon and fry in a medium frying pan in 1 tablespoon wine vinegar. 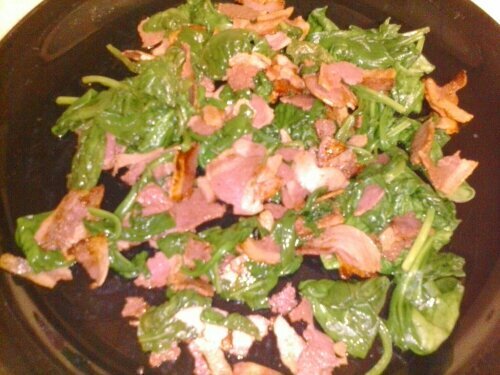 Once bacon becomes crispy, add spinach and remaining wine vinegar. Cook til spinach is slightly wilted. Plate and enjoy! 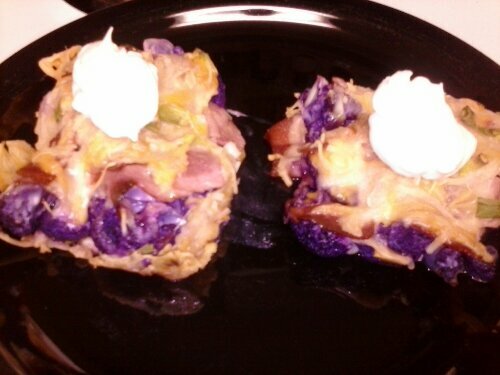 If you like cabbage, You will like these. Heat oven to 400 degrees. Boil cabbage leaves til soft. Dice tomato and warm up in the microwave. Place in blender and puree. 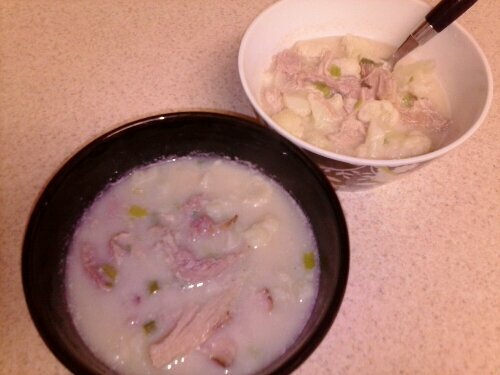 In a bowl mix the meat, cauliflower, and pepper. Run cold water over the drained cabbage. Place half the meat mixture into each leaf. Fold over and place face down in a loaf pan. 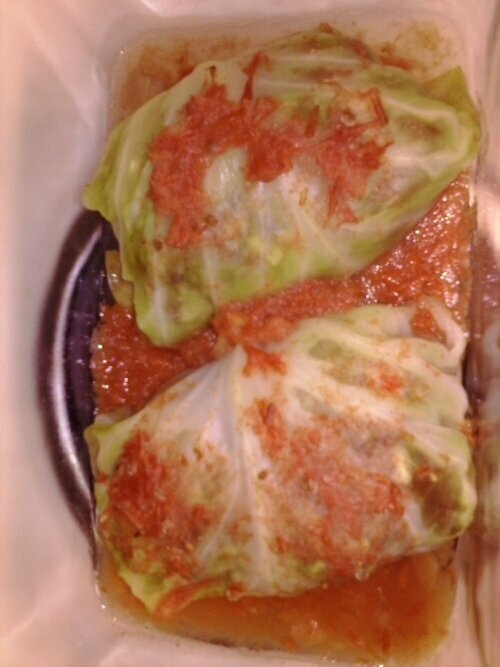 Top with tomato puree. Bake 30 minutes. Approved by TSFL Dieietic Technician. This can be doubled or such to fit your needs and size of crockpot. I just happen to have a tiny one. I also added cauliflower which was yummy. Toss all in a crockpot and mix. Cook High for 3.5 hours.